In "The Freedom of the Writer"
Chapter 6 tells how the novel Deqwan Tebereh, by Eritrea’s foremost, contemporary writer Beyene Haile, sees the role of the intellectual and the artist in the construction of a postcolonial African nation and society. A horn is an instrument either for protection or destruction. 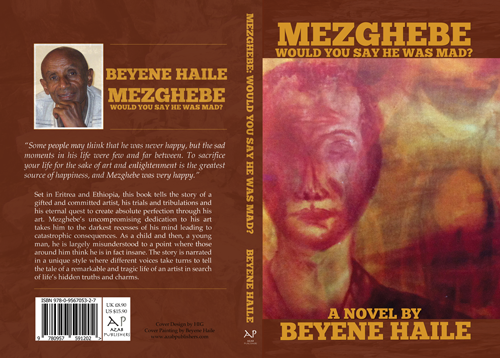 Forty years have already passed since Beyene Haile wrote his first novel. As extensively discussed elsewhere by the present reviewer, his first novel, Abidu’do Teblewo? (1965), differs from conventional Tigrinya writing, at least, in three fundamental ways. Representations of the African Intellectual in the Eritrean Novel Tebereh's Shop. Exhibition of Beyene's Paintings - Asmara, June 2013: Speech delivered by Isaias Beyene Tedla at the opening of the exhibition. Ever since my childhood, I have befriended spots and colours in order to capture the fleeting forms of feelings and ideas – and armed with raw optimism, here I am still searching for beauty. Up until now, there is not a single colour that I do not spill or a blotch I do not toy with so that I can show the nature of my ideas and feelings. Most probably the first time to open my eyes could be the moment I was delivered from the womb of my mother. Irrespective of the level of perception acquired from my sense of sight, it is obvious that I had seen many new things for that new being, me, by that very occasion. ቁሩብንድሕሪት ቁልሕ ምባል ይድለ ይኸውን! ALL PRICES INCLUSIVE OF POSTAGE AND PACKAGING. Beyene Haile: Works of art in general and literature in particular (being the subject of the major part of our discussion) is the quintessence of our being. Not only is it the sum total of our experiences and beliefs, it is the outcome of our future yearnings as well as the picture of the inner forces that trigger us to go for our wishes. Beyene Haile was born in Asmara in 1941. After graduating from the American University of Beirut in 1963 in public administration and political science, he went on to get advanced training in these areas in Italy, Senegal, and Swaziland. Till 1992, he worked in Addis as a training ad management consultant in various private and public institutions, government ministries, and international organizations. A chat with Beyene Haile -an interview with Hidri magazine. Q: How would you describe yourself if people were to ask you tell your true identity? I find this hard to answer because now, as ever before, I am still on the way to discover my true self. Sometimes, I have not stopped wondering if a glance at my quest could throw light on my identity.